My copy of Nature magazine has arrived, with my story Travel by Numbers featured in the Futures section. 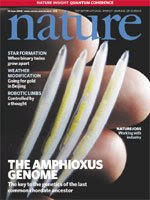 If you don’t subscribe to Nature, you can access the electronic version here. It's under 1,000 words so it can also count as this week's Friday Flash Fiction. Nature magazine boasts some impressive stats. It was founded in 1869 and is now the most highly cited multidisciplinary science journal in the world. I can’t find the circulation figures, but the on-line version has 8 million subscribers. That’s by far the biggest potential audience any of my stories have had. Outstanding, Gareth! I think your uncluttered, empathetic style is going to carry you straight to the top. Thanks Jonathan. I certainly have lots of plans in that direction!